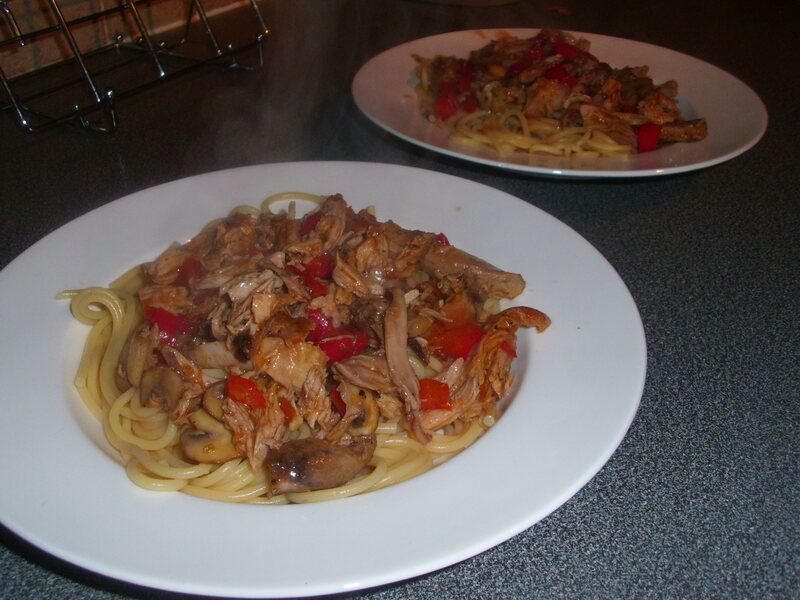 Spaghetti with a rabbit and mushroom sauce – what a great dish! I bet there are those who will be thinking they could never eat rabbit. Well, you don’t know what you are missing! I was brought up in the country and shooting rabbits was part of every day life. I know they are little fluffy things with adorable eyes but they are considered a major pest for farmers, destroying their crops and even munching on trees. They only live for about one year in the wild but during that time they can cause utter devastation. Mum often used to cook rabbit stew. It tasted great but got a bit boring after time and it was difficult to eat what with the small bones and occasional shot! Rabbits were brought into Britain about 2000 years ago by the Romans who kept them in walled enclosures with deep foundations so they could not escape. When the Romans left it is likely that all the rabbits died. They were reintroduced to Britain by the Normans and it is believed that this was the time that some escaped and Britain had their first wild rabbit. The rabbit was delicious. Meaty joints full of flavour, perfect for this dish. Oh, and by the way, the dish takes the meat off the bone so there are no nasty surprises, not even shot! Here is the recipe, I hope you give it a try. Heat the oil in a large pan over a medium heat. Add the garlic and the rabbit joints and cook until browned all over. Add half the wine and let it come to the boil to burn off the alcohol.Stir in the tomato puree and half the stock. Cover and cook for 15 minutes. Turn the heat down to low and turn the rabbit joints over. Cover and continue cooking for a further 25 minutes when the rabbit should be tender. Remove the pan from the heat and take out the rabbit, leaving the cooking sauce in the pan. Allow the rabbit to cool then carefully strip the meat from the bones, making sure no small pieces of bone are mixed with the meat. In a separate pan add the butter and fry the mushrooms and pepper for about 4 minutes over a medium heat. Add the remaining wine and cook for a couple more minutes or until the pepper is tender. Return the rabbit meat to the pan with the remaining stock and tomato puree. Stir in the vegetables and cook for a couple of minutes so the flavours combine. Drain the spaghetti and serve it topped with the meat sauce.